This morning, with so many Presidential convention tweets and Hamilton raves wafting through the air, I found myself drifting away from the usual and endless autism to-do list to muse about the Founding Fathers. Toggling from my 250 unread autism emails, I googled the Declaration of Independence as I sipped my second cup of coffee. I studied how the 13 colonies gathered on July 1, 1776 to decide how to handle growing tensions and to determine if they wanted to remain in their present state or step boldly into the future. Fifty-six smart people signed that piece of paper. Then, I thought about all of the words contained in this brilliant political document, and how much foresight our founding fathers had as they penned them. They held truths to be self-evident. Which made me think about April 7, 2000. Then, I sat in a comfy seat in an auditorium at the National Institutes of Health (NIH), eagerly anticipating the panel’s presentation before about 200 parents of children with an autism spectrum disorder. We had just spent the previous day at Capitol Hill hearings before the House Oversight & Government Reform Committee, entitled Autism: Present Challenges, Future Needs: Why the Increased Rates? I testified in those hearings about the truths I held to be self-evident about my son’s autism, and how I believe it was caused by environmental triggers. We entered the NIH meeting hopeful, but the presentation began with a 10-minute explanation of what autism is. We sighed, but sat there politely. A few more slides passed by as the NIH described how our government was addressing the growing concern of autism. Then, to a stunned audience, they proudly proclaimed that they should have some really great answers for our community in about 40 years. At the time, my son was four years old. As awesome as it would be to ever get any answer about his condition, the thought of waiting until he was 44 for the light to dawn was almost too much to bear. It didn’t make sense. What made sense was pressing forward as diligently as possible to find out what was happening to our children, and finding out fast so that our preschoolers could grow up to be independent adults. Simultaneously, it made sense to the whole audience that we couldn’t let the NIH waste one more minute, so at the lead of one brave mom named Karyn Seroussi, we left to let them get back to work. We went to get lunch, and authored the sad statistic that “autism affects more children than AIDS, cancer, and diabetes combined,” which has become one of our community’s mantras. At least we got something done that day. Until 2007, the NIH ducked autism research. Its budget allows for flexibility in researching diseases and disorders of importance and priority, but autism was thought to be a rare disorder. It didn’t matter that it had increased from 1 in 10,000 to 1 in 500, the perceived rate of diagnosis back then. Now, we know that for children born in 2004 it was affecting 1 in 68. Autism wasn’t a priority to the NIH, or any other federal government entity. So the autism community did something weird: it united and made autism a priority for them. Like the 13 colonies. The majority of the community worked together in a grassroots effort to help Congress pass The Combating Autism Act, signed into law in 2006. This new law asked the NIH and CDC to stop ducking the issue by appointing an autism czar and dedicating funds specifically for autism research and surveillance. Money finally started to flow into the science pipeline. Sadly, none of the research funded by the Federal government to date has identified any known cause or new treatments that might help future generations or those alive today with autism. And let’s acknowledge that it takes a long time from proposing an idea to getting a scientific finding that will inform public policy makers. By way of example, when the NIH issues a request for proposals, the cycle from initial review to funding can take anywhere from 18-24 months. Then there is the matter of actually testing the project’s hypothesis, which can take anywhere from a few months for pilot data or up to five years for a clinical trial. Then, the findings must be published, as it doesn’t really count if it isn’t in print – and that can take another year or two, minimum. 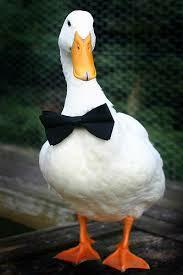 Quack. Quack. Quack. Quack.….the ducks are getting older and there seem to be more of them. The GAO issued a new report in May 2016 lauding the HHS, who had ducked autism for 19 months after the 2014 Autism CARES law was implemented, but finally – in 2016 – appointed an autism coordinator to get after it as far as services and supports are concerned. His name is Dr. Tom Novotny, and his biography shows no discernible experience on autism. 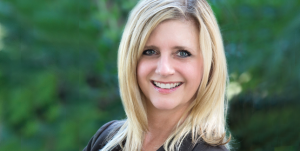 Dr. Novotny was appointed four months ago, in April 2016. So far, his engagement with the public has been to issue a single blog, extolling awareness and acceptance. No big initiatives. No bold statements. No strategy. In his opinion, HHS is doing a wonderful job already—so who needs big change? His blog talks about HHS support for young children. The reality is, the time gap to when young children start to access services hasn’t budged since the CDC has taken data. 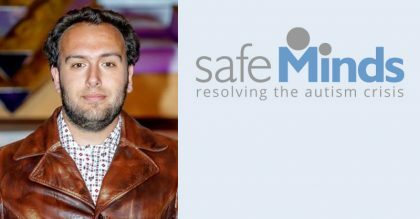 His blog talks about HHS services for families. The reality is, waitlists for services and residential options for the burgeoning autism population are only growing, and that the dismal un- or underemployment rates of 90 percent for people with autism haven’t budged. His blog doesn’t even mention research or treatments. To make a dent in any of these metrics, HHS must commit serious time and resources and appoint leaders who will get the job done – not more who duck around avoiding the hard questions. Americans still look to their government for answers because it has the biggest purse strings, and because it was founded “of the people, by the people and for the people.” Over a million children have been diagnosed in this country since I endured the NIH presentation in 2000. At a minimum. About two million parents of kids under the age of 16 are searching for answers and asking for support. Unless the government recognizes the staggering increase in autism, the will to allocate the resources needed for services and support will never materialize. It’s too easy to duck a problem if you don’t acknowledge it exists. The ducking must end now. Our Declaration of Independence states “In every stage of these Oppressions We have Petitioned for Redress in the most humble terms: Our repeated Petitions have been answered only by repeated injury.” Our families have petitioned time and again for accurate and high quality epidemiology and for concentrated research on environmental triggers for autism rather than chasing the elusive inherited gene. There are a lot of rocks to turn over to find what is causing the autism epidemic, but if we are smart, we can narrow down the number of stones unturned, maximize efficiency, reduce duplication of efforts, and figure it out. We must get way in front of that 2040 deadline. On July 1, 2016, 240 years to the day the Declaration of Independence was signed, 56 smart people and organizations wrote some of the best words I’ve seen in a while and published them on a Government website, rather than penning them on parchment. Their words give me renewed hope that we might be on track to find answers that will lead future generations to healthier, more independent lives. The participants in Project TENDR: Targeting Neuro-Developmental Risks, in a Consensus Statement, said the United States Government has a broken system. Declared it – right there. Historical musings aside, I then get my third cup of coffee and turn to that gnawing autism to-do list. What do we do? Where to go? Is it time for our own autism constitutional convention where all the colonies come together and establish a plan? What can a united autism community do to make sure that the government is aware of this little TENDR announcement last month? Stay tuned for an upcoming blog that I’m adding to my to-do list. Maybe a Petition to Congress, from We the People. 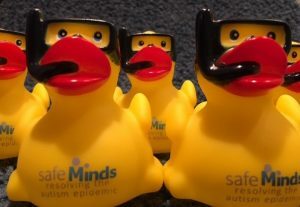 And in the meantime, anyone who donates $20 or more will receive a SafeMinds Autism Epidemic Rubber Duck—for you to show everyone that there is a Ducking Epidemic. Take a picture of you and your duck, maybe with your elected official, or on vacation, and you just might help SafeMinds make the Ducking Epidemic campaign go viral!